Episode 16: Stéphane Hamel – Web Analytics Maturity Model | Beyond Web Analytics! In this episode we talk with Stéphane Hamel about his Web Analytics Maturity Model, thoughts on the Web Analytics Association, WASP, and more. Stéphane Hamel is a leading voice for online analytics, helping businesses understand the value of online optimization. With over twenty years of experience, he has been on both sides of the fence, including client and agency, small projects to complete multi-site, multi-cultural ecosystems overhaul. Stéphane owns a MBA specializing in eBusiness at Laval University (Québec City) where he teaches a graduate class on web analytics. He is also involved in various research & development activities with the prime objective of making web analytics easier. Creator of the popular « Web Analytics Solution Profiler » tool and concepts such as « Just-In-Time Tagging » and the « Web Analytics Maturity Model », recipient of the « Web Analytics Association Leadership and Technical Excellence Recognition » and frequent speaker at the « eMetrics Marketing Optimization Summit » and other conferences, he is also lecturing the « Award of Achievement in Web Analytics » and « Introduction du Business Analysis » classes at the University of British Columbia. Involved in various professional and education events, he is also a member of the « International Institute of Business Analysis » and on the board of directors and treasurer of the « Web Analytics Association ». 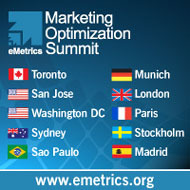 Don’t miss Stéphane’s “Roadmap to online analytics success” workshop at eMetrics in Toronto, San Jose, London and Paris. You’ll find Stéphane upcoming appearance schedule at http://immeria.net/wamm and he’s always looking at opportunities to present it in other cities in collaboration with local agencies. This article was posted in Podcasts, Web Analytics and tagged Maturity Model, Stéphane Hamel, Web Analytics. Bookmark the permalink. Follow comments with the RSS feed for this post.Post a Comment or leave a trackback: Trackback URL. Thanks for catching that! I fixed the post. Super podcast, probably best one yet. Why? Answered all the questions regarding Web Analytics without Borders, WAA and Certification. It’s probably the first time where Rudi and the boys have been so quiet! Ha ha! The info and advice provided by Stephane is so valuable, right from the start of his experiences dealing with I.T and developing the maturity model. Well done guys on another super podcast!